Fox Meadow Vineyards and earned a gleaming place in the spotlight last year when its 2008 Le Renard Rouge won the coveted Virginia Governor’s Cup. However, we had not been to Fox Meadow Vineyards since that well deserved victory; so, we returned to Fox Meadow Vineyards a couple of weeks ago to participate in a vertical tasting to see how upcoming releases were progressing. via Fox Meadow Barrel Tasting | Virginia Wine Time. History, beauty, and terroir meet here in Madison, Virginia, a short drive north of Charlottesville. Named for local Revolutionary War veteran Lt. Joseph Early, whose home served as a makeshift bed and breakfast for Revolutionary notables, this bucolic farm was made into a vineyard by the Sweely family in 2004. In 2011, Steve and Jean Case took over, planning to shake up not only a specific winery but an entire industry with their grand experiment. Their international wine tasting trips exposed them to the finest vineyards and winemakers the world over, and when they decided to create their own, they chose Virginia as having the most potential. Mr. Case, a co-founder and former CEO and Chairman of AOL, and Mrs. Case, the company’s former Vice President for Corporate Communications, started the Case Foundation in 1997 to “encourage collaboration, support successful leaders and foster entrepreneurship,” especially in underserved communities. Knowing that success can be measured in many ways other than amassing dollars, the Cases signed the Giving Pledge, the Buffet/Gates movement through which the super wealthy donate the majority of their wealth to social causes. The Cases practice their doing well by doing good philosophy in an area they love, and their push to create real stewardship for the land made for a natural interest in the former Sweely Estate Vineyard. An emphasis on good works with a superior product rather than on the owners’ celebrity status keep the staff focused on creating a stellar experience for visitors. 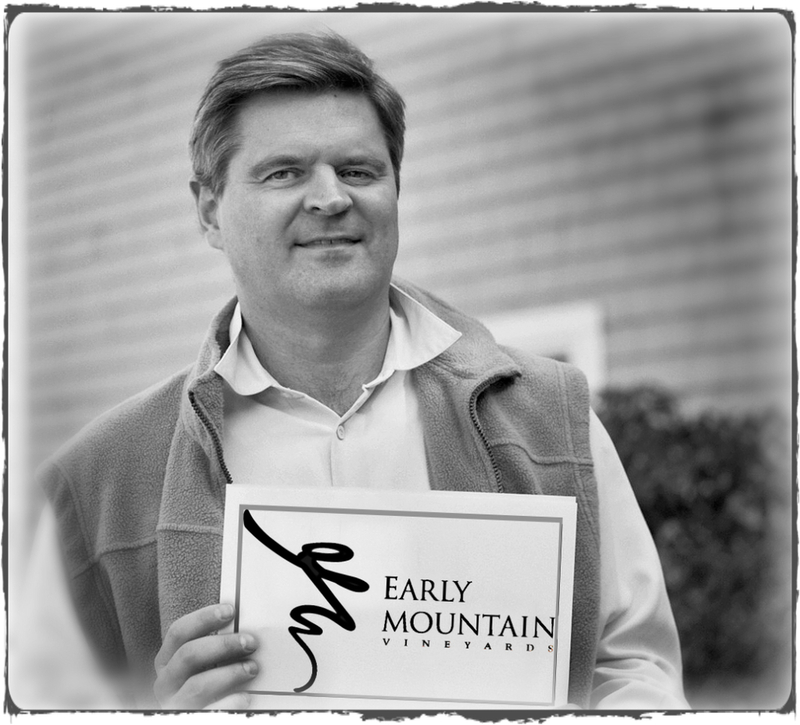 “Early Mountain is a social enterprise—as such, all profits will go toward strengthening Virginia communities and encouraging growth, innovation…[and] learning in the Virginia wine industry. Our goal is not to make money but instead to make a difference,” states Jean Case, enthusiastically. Part of that social enterprise includes providing a showcase for all promising Virginia wines, not just their own. To that end, a visitor can sample flights that highlight themed offerings (Berries! Bright Lights and Bubbles! Red, White and You!) from Breaux, Barboursville, Linden, King Family, Thibaut-Janisson and others. Wine (again, their own and others) is offered also by the glass or bottle, though anyone wanting a case from a “partner winery” will need to visit that vineyard’s website. Right now, their Pinot Gris and 2008 Merlot are the Early Mountain signature offerings. Selections and flight themes will change as new items are introduced. The current list, in addition to the two Early Mountain wines above, has these superior offerings: Thibaut Jannison’s Blanc de Chardonnays “Monticello” and “Cuvee d’Etat,” Linden’s Rose, Barboursville’s Nebbiolo and “Malvaxia” and King’s and Breaux’ Meritages. Of the more than 300 acres on the farm, about 38 have the slope and terroir most suitable for fine production. As the Cases plan to concentrate on the Bordeaux style reds, they have retained Sweely’s Frantz Ventre (the noted vintner from Bordeaux’s Saint-Emilion) and also engaged Michael Shaps (Virginia Wineworks) and Lucie Morton (noted ampelographer and viticulturist). Sweely Vineyard, despite their careful plantings and conscientious winemaking, had flirted with foreclosure for several years before the Cases bought them out. Now, several acres of vines have been replaced and a plan to upgrade quality by a more limited cluster harvest is in force. The 2004 vines, unusually densely planted, are in their prime. The tasting room (referred to as the Celebration Hall) is airy, open and on a grand scale, with cool, chic décor. Taupe, greys and Virginia clay are the predominant colors, with heavy ceiling beams spanning the cavernous hall. Polished concrete tasting bars continue the cool feel; the entire visual experience is elegantly designed and finely coordinated. Several oversized fireplaces (indoor and out), numerous comfortable seating areas, and a variety of fire pits adorn the grounds…make sure your party knows where you are, as it would be easy to be in the same winery and never see one another! The baronial downstairs hall was made for weddings and has a patio so your party can spill out into the night. The Market, a small food boutique in the main hall, features local cheeses, cured meats, fruits in season and assorted prepared items, heavily playing up the eat-local, drink-local theme. Picnic blankets are available for borrowing, and spending the afternoon is highly encouraged (mobile charging stations make it easy). Exceptionally family friendly, Early Mountain and its enthusiastic staff stock crayons, bubbles, board games and S’mores kits for roasting over one of their fire pits. Leashed pets are welcomed as well, with water bowls and doggie treats available. Staff members are remarkably friendly, voluble, knowledgeable and cheerful. Although this might be considered a requirement in a fledgling industry, the Early Mountain enthusiasm is a cut above. And Michelle Gueydan, with a very impressive CV despite her young age, is a marvel of charm, efficiency and effectiveness: turn her loose on your event and consider it done. A stand-alone cottage serves as a dressing suite for brides, and at least one other outbuilding is scheduled for upgrading to the current Early Mountain standards. Though just a few minutes drive off Route 29, the views and vibe are that of a country valley. All in all, Early Mountain is a great place to spend an afternoon with family or friends. It does not produce, by itself, a full gamut of Virginia wine, but by cleverly linking with others, it presents an upscale, relaxed and approachable introduction to Virginia’s finest. With their many holiday or theme specials, Early Mountain is a great way to travel the state while seated in a most comfortable chair, enjoying a breathtaking view. And, yes: George Washington did sleep here. To read more check our our Virginia Wine Tour Trail Guide Here. To Request a Tour Click Here. For the active couple or family searching for a vineyard that offers more than just your standard day of wine tasting, look no further than thirty minutes south of Charlottesville in Faber, Virginia. Located in a rural community, DelFosse vineyards are terraced into the mountains. The site offers plenty of sun, good elevation, essential wind streaming and a picturesque setting. When owners Claude and Genevieve DelFosse first came upon these 330 acres in Nelson County, it was clear that they had found something special. The journey started in 2000 when Claude DelFosse, originally from Paris, left his career as an aeronautical engineer to start a new life as a wine maker and vineyard manager. Claude was joined in this endeavor by his wife, Genevieve DelFosse, a talented cook, local food advocate and educator with the Fairfax County School System. Over a decade later, the DelFosse family now has 22 acres under vine with plantings that include the usual Merlot, Cabernet Franc, and Petit Verdot, as well as Chambourcin, Sauvignon Blanc, Malbec, Cabernet Sauvignon, Pinot Gris, and Petit Manseng. The DelFosses have a passion for wine and have become known for their personal commitment to adopting and perfecting sustainable environmental practices for the wine world. In the tasting room at Delfosse, winemaker Paul Mierzejewski developed a strong reputation for quality over the years. Although trained in California, he has been working in Virginia wine country since the early 1980s and has become intimately familiar with the challenges Virginia winemakers face within the industry. Through his stewardship, the grapes are allowed to display the characteristics of their terroir with the goal of ultimately producing a quality wine that embodies the unique characteristics of the region. The grapes of DelFosse could not be in better hands and thrive in one of the only terraced vineyards in the state. Vineyard consultant Chris Hill has over 30 years of experience planting, training and managing vineyards. A celebrity in the world of Virginia wine, Chris is known for his green thumb and valuable insights. Similarly, the full time vineyard manager, Grayson Poats, comes to DelFosse from Wintergreen Winery with a strong background in viticulture. Along with the owners, the staff clearly enjoys creating a memorable experience for their guests. DelFosse Vineyards hosts many events throughout the year: there are classes, and options for weekend getaways, including a century-old log cabin for rent, perched at the top of the vineyard. A popular spot for weddings and romantic weekends, this quaint little rustic cabin was renovated in 2005 and has breathtaking views overlooking the wine tasting room, lake, and terraced vineyard. It is a lovely place for guests to relax, unwind and share a bottle of wine. They also host a full events calendar of barbecues, food and wine pairing sessions, and holiday celebrations.... To read more check out our trail guide on the Monticello AVA! The future of U.S. wine is in Virginia! 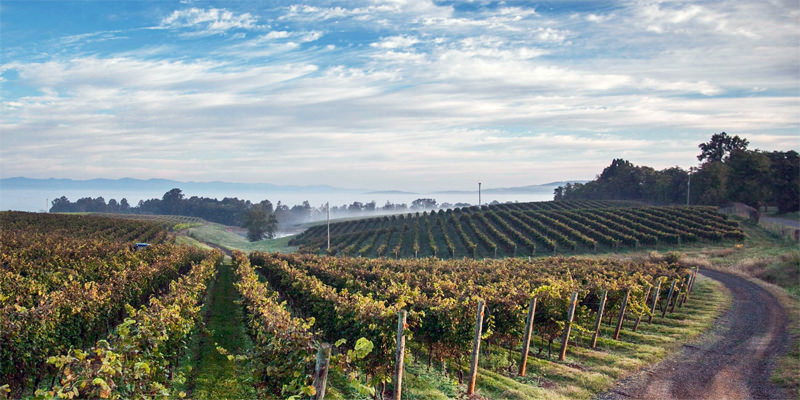 Check out the article below from Vine Pair about how Virginia Vineyards like Barboursville Vineyards, Linden, and RDV are taking the country, and world, by storm. Our best kept secret is getting out -- and that's a good thing. Blue Ridge Excursions Unlimited is here! Since our founding in 2008, we at Blue Ridge Wine Excursions are proud to have earned the right to call ourselves the #1 provider of guided wine and brew tours in Charlottesville (be sure to check out our TripAdvisor Reviews). Going forward, we are excited to continue to introduce our clients to the vibrant community of artisans and innovators who make the Monticello Wine Trail such an amazing place to explore. As we look around Charlottesville however, we see so much more that we want to show our guests! Cville and the surrounding Piedmont region is such a special place, where people care deeply about where their food comes from, preserving the beauty of our rural and wilderness spaces, and honoring the history that continues to inform and shape the place we are lucky to call home. With that bit of backstory, we are excited to introduce Blue Ridge Excursions Unlimited! We have crafted unique tours that give visitors a chance to dig deeper into this amazingly rich and vibrant region. Take a walk on hallowed ground. Trace your meal back to its source. Imbibe wine made in the tradition of our forefathers. Take a boat ride down a timeless waterway. Jump head first into foodie heaven. These are places you won't find on the standard Cville Tourist map, but are the makings of amazing memories. Let us show you what gets us so excited about this town, won't you? Join us for a tour soon! CLICK HERE to visit Blue Ridge Excursions Unlimited and learn about our new Tour Offerings! The Gormans’ connection to Virginia wine country dates back to their purchase of property near Afton Mountain in 1985, but the dream of owning a vineyard dates to a few years before that. In the early 1970s, General Paul Gorman and his family were posted in the small city of Bad Kreuznach, Germany. This remote region of Germany was known for producing some of the world’s finest Rieslings, and those few years spent in this wine-rich region were enough to instill the dream of a family vineyard for the Gormans. Upon returning to the United States, they began searching for suitable land, and eventually found an excellent site in Afton. This established a setting for the family winery, but its realization required patience enough to wait for the next generation. First as the vineyard manager and later as a winemaker, Tim adopted the old world philosophy on the winemaking process: “[t]he quality of the grape is the most important part of the wine.” He returned to school in 1991 to study horticulture and spent ten years focused exclusively on growing excellent grapes before moving on to actual winemaking. Meanwhile, the rest of the family had also been hard at work. While brother John was renovating, their sister Sarah was learning all she could about the wine business, and eventually took on the role of operations manager. When Tim met and later married a fellow horticulture student named Susan, she stepped right into the family business as well, serving as the tasting room manager. The family’s patience finally paid off in 2002 when they served their first vintage and opened the Cardinal Point tasting room. What had been a distant dream of Paul and Ruth Gorman had grown into a fully operational winery in Nelson County, Virginia. Grab a Wine Tour Gift Certificate today for the wine lover on your Christmas shopping list! It is the perfect, always fits / is the right color, gift, that never goes out of style. We can customize your Wine Tour Gift Certificate to include to stops ate breweries and cideries as well. Packages can include locally catered gourmet lunches, custom designed itineraries with reservations at each winery, brewery, or cidery. Our fleet of Mercedes Sedans, Yukons, Denalis, 14 Passenger Executive Coaches and larger coaches means we can provide wine tours for family reunions, wedding anniversaries, birthdays, and bridal or bachelor parties of any size. Call us if you are interested in learning more about getting a certificate for the wine lover in your family. On December 5th, 1933, the 18th amendment instituting the nation-wide Prohibition of Alcohol was repealed, and the people rejoiced! Celebrate your rights with us on Friday, December 5th, with an evening of libations, live music and levity. Flap the night away to the jazz and swing stylings of Zuzu's Hot 5, then slake your thirst at the mimosa-style cider bar. Enjoy speakeasy-themed hors d'oeuvres by Harvest Moon Catering, picked to pair deliciously with our sparkling ciders. Show off your flapper dress or your bowler hat with the MoxBox photo booth experience; dress up or dress down for this one-of-a-kind event! Tickets are $30 per person and include food and drinks. E-mail fruit@albemarleciderworks.com or call us at 434 297 2326 to reserve yours today. Or, sign up online here. We had yet another FABULOUS Virginia Wine Tour experience through Albemarle Limousine and Blue Ridge Wine Excursions this past weekend. Andy crafted an itinerary that included wineries we had not visited as well as a stop on the way to pick up delicious sandwiches from the Greenwood Gourmet Grocery for our lunch. Every detail was perfect and when dealing with Blue Ridge - I always feel like I am their only customer - their customer service is top notch! Bergen, our Wine Trail Guide, was amazing and took such good care of us! It was a beautiful day to relax and enjoy stops along the Appellation Wine Trail. We are looking forward to our 4th annual weekend next year and will definitely be using Blue Ridge Wine Excursions! Cheers! For my wife's milestone birthday, we wanted to do something really special. We had decided to do a wine tasting tour with our close friends. We ended up choosing Blue Ridge Wine Excursions to provide the transportation. We selected a Shuttle for our party of 14. We had Bergen as our Wine Trail Guide for the afternoon tour. He was great! Bergen was very professional throughout the entire trip and made the drive very enjoyable. He was quite accommodating with our requests. In addition, he also kept track of the time for us so we would not get behind schedule. The shuttle was very clean and comfortable. The drive was relaxing and everyone on board had an amazing time. Blue Ridge Wine Excursions was also very easy to work with as well. Their communication was very prompt and they were eager to help in any way possible. They had many different options and packages to choose from and worked to get us the best options that suited our needs. We couldn't have asked for a better experience with Blue Ridge Wine Excursions and will definitely go back to them for another Wine Tasting Trip in the future. For more of our Virginia Wine Tour Reviews Visit our TRIP ADVISOR! Virginia’s Foggy Ridge Cider was one of the first to produce old-fashioned artisan cider from heirloom apple varieties when it opened in 2005. Today, Virginia has 10 cideries, including the popular Potter’s Craft and Albemarle Ciderworks. Castle Hill Cider, northeast of Charlottesville, draws on ancient winemaking techniques to age some of its ciders in kvevri, or clay amphorae buried in the ground. Cider is also hip: Blue Bee in Richmond is Virginia’s only urban cidery and probably one of very few in the country. Virginia wineries are joining the fun, with Cobbler Mountain Cellars in Delaplane and Corcoran Vineyards in Waterford recently offering ciders. Virginia cider also can apparently slow the passage of time: Virginia Cider Week runs 10 days, through Nov. 23, with restaurants and retailers across the state featuring local ciders. Blue Bee makes Hopsap Shandy, a delightful cider flavored with hops. Think India Pale Ale without the weight or excessive bitterness. Millstone Cellars in Maryland also infuses some ciders with hops, as well as fruits and spices. Great Shoals Winery in Maryland produces Spencerville Red from an apple variety discovered a quarter-century ago in eastern Montgomery County and grown by Heyser Farms in Colesville. You can’t get more local and creative than those. Many of these local ciders have good regional distribution. The national market growth, however, is being driven by large brands produced by beer companies. Today’s highest-selling brand in the United States is Angry Orchard, owned by Boston Beer. MillerCoors acquired the popular Crispin brand in 2012 and introduced Smith & Forge cider this year. Last year, Anheuser-Busch InBev introduced Stella Artois Cidre to the U.S. market, and this year launched its own domestic brand, Johnny Appleseed. Woodchuck Cider is owned by Irish beer giant C&C. According to Crain’s Chicago Business, the beer companies were determined not to let the hard cider bandwagon pass them by the way craft brewing did. RICHMOND – Governor Terry McAuliffe announced Wednesday that sales of Virginia wine continued solid growth in fiscal 2014 and reached another record level, increasing by almost 2 percent from fiscal 2013. Virginia wineries sold more than 521,000 cases of wine, or approximately 6.25 million bottles, in fiscal 2014. That's up from just over 511,000 cases in fiscal 2013. Sales of Virginia wines have increased by almost 26 percent since fiscal 2010. According to figures from the Virginia Department of Alcohol Beverage Control (ABC) and the Virginia Wine Marketing Office, total sales of Virginia wine contributed to more than $1.7 million in wine liter tax collections during the fiscal year that ended June 30. The Virginia wine liter tax is applied at a rate of $3.60 per case of wine sold in Virginia. In addition, Virginia wine sales at wineries increased by 6.7 percent in fiscal 2014 from the previous fiscal year. The increase indicates solid visitor traffic to wineries and Virginia wine events. However, with wine grape production flat due to several factors, including some early spring frosts, sales through other channels have flattened or decreased as wineries focus sales to meet growing demand at wineries. Please join us for an exciting Father's Day four course bruch paired with wine for $65 per person (inclusive of gratuity). Attire is casual. Please arrive at noon to enjoy a glass of sparkling wine before we sit down. Reservations required. CONGRATULATIONS to Daphne D'earth Latham! She is the winner of our Quarterly drawing for a FREE Sunday - Friday Wine Tour for up to 6 people! His tour certificate is valid for up to 12 months. Be REALLY nice ... who knows, you may get to tag along! Post photos and comments on your tour with us for your chance to WIN! Our monthly winner will be awarded later this week. *Offer excludes holidays and holiday weekends. "Sure, Thomas Jefferson made wine in Virginia more than 200 years ago — but what has Old Dominion been up to lately? The state’s annual Virginia Wine Summit last month was abuzz over 2013’s magnificent harvest, with low humidity and little rain ripening the grapes to optimal vino quality. The best news is, this year was a virtual repeat of last year’s stunner season, and some 2012 bottles are available for purchase now. But try to curate your own Virginia wine selections from the state’s 230 winemakers and you’ll be sampling from now until next fall’s harvest. Gathering several wineries’ labels in one tasting room in Madison, Virginia, Early Mountain Vineyards’ goal is to “champion and celebrate the best Virginia has to offer” — both their own wines and the wines of competing estates. “Our sommelier Michelle Gueydan and I tasted everything we could all over the state before we opened, because we’re passionate about uplifting the entire state,” says Erich Broksas, head of strategy at Early Mountain. The winery, which was bought by AOL magnates Steve and Jean Case nearly two years ago, has become a Virginia wine hub. “We have always believed in the potential for Virginia to emerge as one of the world’s top wine regions, known for distinctive varietals, and I’m excited to taste this year’s wines as we, and other vineyards in the state, hone in on our region’s very distinct terroir,” Jean says. The tasting room is an ideal one-stop-shop for sampling the state’s offerings, with eight or more labels being poured at the long bar or in several semi-private, wholly cushy sitting areas arranged around a hearth, with stunning views of the Blue Ridge Mountains. Early Mountain’s commitment to Virginia continues to local, artisanal foods paired with wines, making it dangerously easy to enjoy a full casual meal (90 percent of which is sourced in Virginia) of paninis, charcuterie (including famed Edwards’ Berkshire ham), and local cheeses while lazing on the fireside couches. Or up the ante with a composed dish, such as the smoky bourbon barbecue-braised pork shank with apple fennel slaw. “Our wines are Bordeaux inspired and built to be paired with food, to be experienced in the context of food. They’re not high-alcohol cherry bombs,” Broksas explains. Coming up: “Drink This With That,” a pairing seminar on March 28, 2014, and an artisan market for the holidays. Quarterly Wine Tour Winner - Mary Stamps Beebe! CONGRATULATIONS to Mary Stamps Beebe! She is the winner of our quarterly drawing for a FREE Sunday - Friday Wine Tour for up to 6 people! Her tour certificate is good for up to 12 months. Start saying nice things to her and she may invite you to join! Post photos and comments of your tour with us for your chance to WIN! Our monthly winner will be awarded later this week. Happy Anniversary to Virginia Wine Time. Thank you, Warren and Paul for all of the wonderfully informative and entertaining posts over the past eight years! Visit VirginiaWineTime.com to learn more! Happy Blog Anniversary to us! Today is the 8th anniversary of us starting Virginia Wine Time. 8 years ago today we started sharing our Virginia winery experiences with you. Over the years we’ve visited 163 Virginia wineries, posted 815 times, had roughly 130,000 visits and received 536 comments on our posts. We have no plans on stopping anytime soon! We hope all our readers have enjoyed the blog and will continue to check back to read each post. Thank you for being loyal blog readers! We appreciate you visiting our site! The Daily Progress has story about Gianni Zonin, of Barboursville Vineyards, receiving lifetime achievement award from Wine Enthusiast Magazine Gianni Zonin, the owner of Barboursville Vineyards, has been named the 2013 Lifetime Achievement Award winner by Wine Enthusiast. Zonin is chairman of Casa Vinicola Zonin, a company of family-owned vintners since 1821 and currently the largest private wine enterprise in Europe. The company owns 11 wine estates in Italy and the Barboursville Vineyards in Virginia. Zonin established Barboursville in 1976. Wine Enthusiast also has named Eric Trump, owner of Trump Estate Vineyards & Winery in Albemarle County, as a finalist for its 2013 Rising Star Award. The presentation of the Lifetime Achievement Award and the Rising Star Award will be made on Jan. 27 in New York City. Stand back, ladies and gentleman. Leave this to the trained professionals! Meet, Bergen, Justin, and Michael; just a few of our everyday, run of the mill, extraordinarily knowledgeable and charming Wine Trail Guides! Our Wine Trail Guides are your "Concierge on the Go." Justin Stone: Justin Stone has a love for the culinary arts and operates a dinner club at night. He knows which wine best pairs with which meal, and has a keen eye for details and enjoys the nuances of Virginia Wine. Bergen Hanson: Bergen Hanson has been an integral part of Blue Ridge Wine Excursions since its inception in 2008 and specializes in understanding the needs of, and meticulously caring for, all of our vehicles and clients. When off duty, Bergen moonlights at the CFA institute. Most Saturdays you can find Bergen on the Wine Trail or celebrating at a wedding. What a rough life! Michael Moore: Michael Moore is an international award winning graphic designer and enjoys sharing stories of the area with our wine trail guests. He has created a bow-tie system, "The 'Mr. Mickey'" which is an eco-friendly and one-of-a-kind since each tie is made from upcycled neckties. You will never see him on the Wine Trail without one! In the thirty years since my husband and I arrived in Charlottesville, I have been amazed at how this area has grown and changed. Of all the changes, perhaps the most extraordinary has been the development of the Virginia wine community. Our region is now a top destination for wine lovers, as well as for those who simply enjoy the ambiance of a small, beautiful university town, rich in history. My own introduction to the Virginia wine industry came in a circuitous way. When one of our children married, we wanted to surprise the new couple with a chauffeured vintage limousine ride from the University Chapel. Without any local options available, we were delighted when a family friend offered to drive the bride and groom in his vintage limousine. The car and the experience were wonderful. After the nuptials, I decided to make a business providing gracious service in beautiful vintage cars for weddings. The response was overwhelming.